The Maltese is seen as a ball of hair. Glamorous, difficult and dainty. The Greeks put up tombs for their dogs and a model was found in Egypt as well. They’ve been an aristocrat for 28 centuries, with documentations of the breed as early as 40 A.D. These have long been household pets for people with means. They were healthy and although small in size large in temperament. They have a long beautiful coat that is hard to overlook when groomed right. By the standard the Maltese is less than 7 pounds with a preference of 4-6 pounds if the quality is there. They’ll possess a smooth gait with an impression of fast movement. He projects fearlessness with affection. Lively, playful, vigorous describe this breed. This is a companion breed that takes regular grooming to keep tangle free especially after playing in puddles! If you're serious about wanting a calm, well-behaved little dog... this is the training method for you. His coat should be straight, not curly or wavy and his body is slightly longer than he is tall. This is a hardy companion that is fine boned but not exactly dainty. They do need regular maintenance and grooming to keep the coat beautiful. Even among pet dogs, which can be trimmed to have a shorter coat than show dogs, daily brushing helps keep the coat in good condition. In a home environment the Maltese is typically active and playful with a devoted nature. They generally trust people and are very intelligent. Like most smart dogs they are good at learning things and indeed need to learn. A balanced attitude is needed to keep the Maltese eager to learn and yet disciplined to not learn the wrong things. This is generally a healthy breed but not without issues. Good routine preventative care is essential but there are issues that can arise even with that. “Reverse sneezing” is apt to happen when excited, eating or drinking or during exercises. Although relatively common in the breed it is not something that gathers serious concern. However one thing that appears the same can be a collapsed trachea. This is a condition that seems to affect certain breeds of dogs leading some to believe it is genetic in origin. The dog may cough or ‘honk’ and if very light pressure is placed on the throat causes a reaction it can be a collapsed trachea. X-rays can confirm the condition as well as an endoscope. While doing x-rays it is worth taking chest shots to check for heart disease at the same time. There are treatments available but they don’t always work. Use extreme caution in corrective jerks during training to prevent damaging the trachea or lunging at the leash. Liver shunts also affect the Maltese and should be considered especially if under a year old. Typical signs can be a puppy that doesn’t thrive despite good nutrition. Poor weight gain, weakness, depression and an apathetic attitude are indications of the disease early on. Other signs are weakness, seizures, excess salivation, vomiting, poor appetite, bladder stones, blindness and balance problems. Lab work including x-rays, ultrasound and radioisotopes can verify this genetic disorder which requires surgery. Skin allergies, separation anxiety, car anxiety and retinal atrophy can all affect the Maltese also. This is a good apartment or house dog due to a sometimes low tolerance for damp weather. Inside they can be quite active and playful, but they are happy with some outside play and a regular walk for exercise. The smaller size means watching to insure your Maltese does not get too overweight. Balance the food with exercise always! With small dogs just a couple pounds can be enough to affect their health and shorten their lifespan. Dental care is also important either with teeth cleaning by a vet or with natural methods of chewing toys and bones. Keeping the plaque and bacteria down helps eliminate not only dental issues but can lead to heart and kidney disease. A Maltese is a true companion. They want to be with you whether it’s sitting near you as you watch television or going for a walk. They like to be with their owners and can be playful for most of his life with good care, living well into their teens. Although the Maltese do not shed seasonally like many breeds do they do shed, which is another reason for regular grooming. While sunshine and fresh air is good it’s important to remember, especially with dog thefts on the rise, that the Maltese is a friendly breed that loves people. This makes a huge target for a thief. Also worth watching - their bone structure makes them physically not a dog for roughhousing with children or larger dogs. They are apt to play full on and, as such, apt to sustain injuries that are serious. A crate is highly recommended for any puppy but especially small dogs like a Maltese. This allows a safe place to be should you travel and it’s also a place that he can retreat too during holidays and other times when the household is “too busy” for his comfort. Additionally if there should ever be emergency evacuation orders, a Maltese comfortable in his crate is much less stressed and much safer than a loose dog. 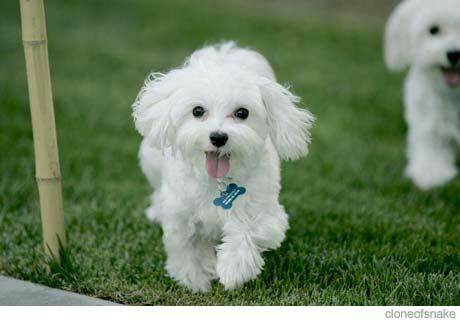 A happy, outgoing Maltese is a product of a commitment by the breeder and owner. The breeder selects the healthiest, best animals to increase the chances of quality animals rather than just producing puppies. The breeder cannot control things for life – when you purchase a puppy you pay for a companion and assume the responsibility for his training. Expose them to as many things as possible and be consistent. Maltese are small and fluffy – the “cute” factor is in full motion and it’s important to be attentive to having discipline in place. Teaching boundaries and manners insures that your dog won’t be a training problem that results in so many dogs being dumped at shelters. Many breeders have a standing offer to always take the dog back should you not be able to keep them and it’s important to honor this agreement if it is in place. Like other dogs with white hair on the face, tear stains can be noticeable on Maltese. This might be from the water, allergies, infections or blocked tear ducts. This is an ideal dog for adults who are committed to a pet that is just as committed to them. They are a fairly active breed but not so much so that it’s a marathon to exercise them! With a good balance of love and discipline this is a breed that takes up permanent residence in your heart. Choose an individual wisely and prepare for a wonderful pet in a Maltese. David Beart is the owner of the Professors House [http://www.professorshouse.com]. Our site covers family related issues from raising children to dog health [http://www.professorshouse.com/pets/dogs/dog-health.aspx] (link inactive), relationships to cooking.